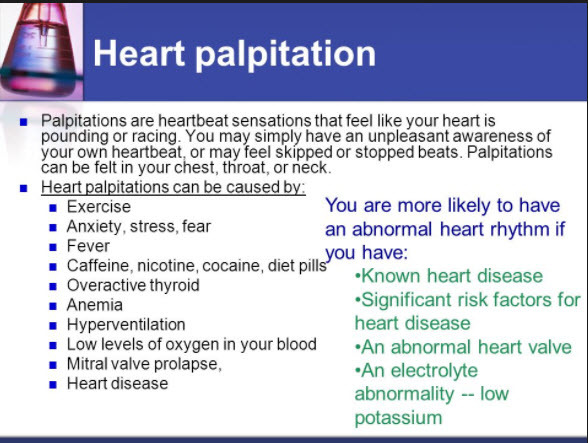 Heart palpitations are heart poundings, flutters, or skipped beats. Although they can feel scary, most aren’t serious and rarely need treatment. Knowing what makes your heart race can help you not panic when it happens and know when to call your doctor. Intense emotions can trigger the release of hormones that speed up your heartbeat. Your body gets ready to face a threat, even if you’re not in danger. Panic attacks are intense bouts of fear that can last a few minutes. Symptoms include a racing heart, sweating, chills, trouble breathing, and chest pain. A panic attack can feel like a heart attack. If you’re not sure which one you’re having, get medical help. Working out is good for you. And a brisk run or intense indoor cycling class will naturally make your heart beat faster. That helps your heart pump more blood to power your muscles through the workout. If your heart flutters or pounds, it could be because you haven’t worked out in a while and you’re out of condition. An irregular heartbeat, or arrhythmia, can also cause palpitations when you exercise. Does your heart beat faster after your morning latte? Caffeine is a stimulant that raises your heart rate, whehther you get it from coffee, soda, an energy drink, tea, chocolate, or another source. One study found that caffeine from coffee, tea, and chocolate isn’t likely to cause palpitations in people with healthy hearts. But experts don’t know whether it might trigger them in people with heart rhythm problems. Women might notice that their heartbeat speeds up when they have their period, they’re pregnant, they’re close to menopause, or they’re in menopause. The reason: hormone levels. The boost in heart rate is usually temporary and no reason for worry. If you’re pregnant, palpitations can also happen if you’re anemic, which means you don’t have enough red blood cells that carry oxygen throughout your body. If you take one or more of these types of meds, ask your doctor if it could affect your heartbeat. Don’t skip any doses before you check with your doctor. Have you ever noticed that you feel shaky, cranky, and weak when you’ve skipped a meal? It can also lead to palpitations. When your blood sugar level drops, your body releases stress hormones like adrenaline to prepare for an emergency food shortage. Adrenaline speeds up your heart rate. If you drink a lot, or just have more than usual, you might feel your heart beating faster or fluttering. It often happens on holidays or weekends, when people drink more, earning it the nickname of “holiday heart syndrome.” But for some people, it can happen even when they only drink a little bit.